As promised lo these many months ago, here are pictures of our back yard project. Can you stand the excitement?? If yes, then try to edit out all the muddy bits and start over because believe me: it is something! A friend - I am using that term loosely for soon-to-be obvious reasons - saw the completed build and asked whether the pergola does anything and also, why we made it look like a Roman colonnade. Since I've asked myself the same questions I can't hate on him, but Gah! did he have to voice my own concerns??? Actually, Ray brought up the Roman thing as a risk when I first asked whether we might be able to reuse our original porch columns in the back yard. But when it was done, he loved it, and we all do too, and anyway it's just the bare bones of what's coming next summer when we will train a flowering vine over it. Even if it's still weird after that, it's a nod to the house as it was when we bought it and added on the porch of Pete's dreams. History matters to us and so, that is enough. The middle section of the new pergola marks a path to the path at the back of the yard, which is one of the non-functions of the pergola. It's meant to create the illusion that there is 'more' behind it. In a limited space like this anything you can do to suggest depth and add height is a bonus. Here's how it looked with just the path and no pergola, during the period when I was laying and re-laying bricks and slabs to get them just right. It was backbreaking work and I think after over twenty years of setting down stone paths at this house I might now be, officially, Too Old For This Sort Of Thing. Please note, this was without me laying the big slabs, which was Pete's job, as I hovered nearby with the level and a small bucket of limestone screenings. There was just as much laughter as there was cursing during that part of the project, which made it more fun than the solitary work! ... with the pergola in, it is SO FUN to walk to the back corner of the yard without getting muddy or even, I hope someday, wet from dewy grass. We have never been able to do that before, despite all the different garden designs we've tried out over the years, because we always assumed we needed a big shrub in that area as an anchor and to hide the shabby, falling-apart fence we lived with for the first 20 years. The planters on either side of the passageway were an amazing bargain find from - wow, it's got to be four years ago now. 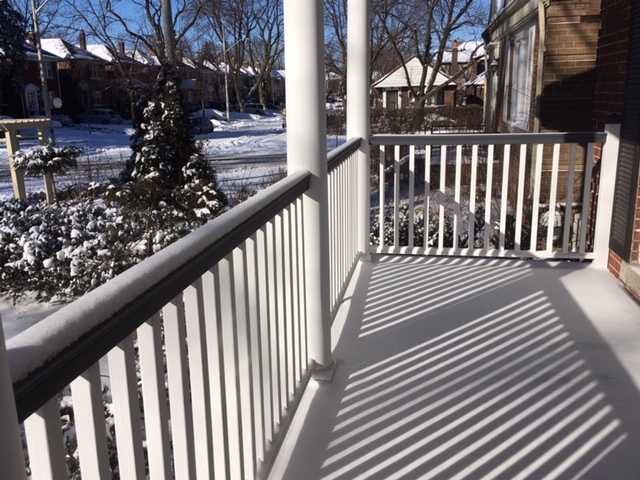 I always intended to use them in this way, and I always intended to choose the deep blue-grey of the fence based on them and also, on the colour of our front porch pre-renovation. Also because as awesome as this dark blue-grey looks in summer when surrounded by green leaves, it was a misery last winter, on a bleak day under snow and bare branches. I never noticed that on the front porch, I guess because we have a bushy evergreen hedge alongside it? Thankfully, this winter it looks great for some reason - maybe it wasn't the grey that bothered me so much as the piles of construction leftovers in the yard? All that's gone now. We still have the mud, but under the snow you can't tell it's not grass. Oh yes, the mud. 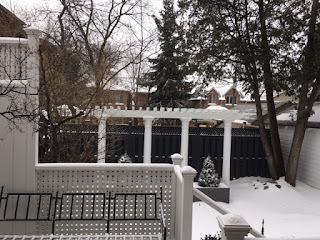 By the time the pergola and paths were done it was too late to plant perennials or lay down grass seed, but my genius horticulturally-obsessed friend Claire sourced our two perfect spruces for me which were still safe to plant. I love them more each day. 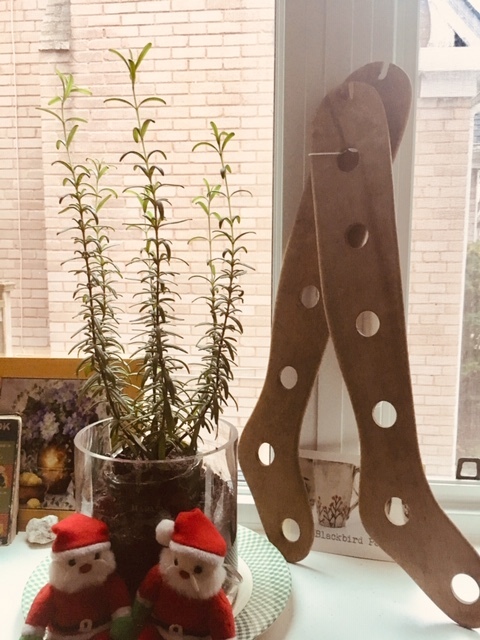 We already had a spruce from our early days here which everybody felt should stay as a carryover from that time, and it is nice to tie that in. Spruce trees are not quite as soft as they look - the needles are in fact a bit stabby - but I keep wanting to hug these two anyway. They are just so bunchy! *I've had problems with sickly boxwood for years and thought it was just me so now I feel so much better about myself. Again: hats off to Claire. The white is VERY white - Benjamin Moore's 'Chantilly Lace' which has no undertones - and what is particularly great is that some of what's out there is pressure treated wood protected with opaque stain we had tinted to that colour, and some of it is previously-painted wood we covered with flat paint tinted the same colour so it looks like it's all the same finish. I will probably say this if I ever get around to doing a post on paint, but we use Ben grade paint now, rather than the top of the line Aura from Benjamin Moore. Aura is designed to dry very very quickly, which I guess is a plus? But I'm a fast painter and the drying time is still too speedy for me to finish a section without peeling some off as I got over it with the next overlapping swipe. Even Ray couldn't get a decent finish with it. So now we pay less and have better results. Win win! Anyway, to return to the top of this post: the bright, stark white of Chantilly Lace is effective because you can't not look at it. No matter how much you want to see the oversized climbing equipment in the next yard, or the basketball net, or the Hydro truck creeping down the laneway beyond, you canNOT drag your eyes away from the pergola long enough to quite realize you are not, in fact, looking at a small garden room at the back of a pretty house in an English village. And that whole deception should get a lot easier to believe after we get the finishing touches on next spring. I should have told my friend that when he asked what the pergola does, don't you think? I should have said, It makes our home our home, the way we always imagined it. The front porch was SUCH a nightmare to rebuild. I didn't want to have to go on with the constant maintenance we used to have to do - scraping and painting the wood every summer - so we actually bought and paid for delivery of vinyl railings that turned out to look utterly awful, as well as impossible to put together properly. We had to eat that whole expense, and start over with wood, which Ray had to improvise into a hefty handrail because there was no such thing available ready made. Looking at the beautiful shadows across the floor of the porch in that picture reminds me of my old life when this house was tiny and I was a knitting fiend, publishing posts here every day of something new I was working on, usually with images of them posed on the front porch (and especially in the shadows from the pickets!) I had inexhaustible energy, and people started their day reading my words on purpose because it was a happy way to begin - that meant so much to me. The online world has changed a lot since then... Instagram wasn't even a thing at the time, or else not as big a thing. Pictures have become much more important to people than words, don't you find? I'm still trying to figure out my new life, now that it doesn't revolve around renovation or lighting selection. I am writing more now (yay!) and knitting less (wha? ), unsure of what among the things I'm doing will interest people, and still dealing with the loss of my old computer/camera setup that made it so easy to get pictures from creation to publication. All of which is to say: sorry for the long absence, as well as the one that may well follow it! And especially: thanks for dropping in to read this Hug. Take care of yourself and I hope we meet up here again soon! Well there! Either you are, or I am, seriously telepathic. It was only yesterday that I was wondering what had happened to you and if you were ever going to post again! Please don't go exclusively to Instagram. I love photos but prefer words,(and photos), in a blog. I like to hear what people have to say and share, and Instagram is so impersonal somehow. Actually, I can talk. I started a blog in 2016, didn't do much in 2017 and now it has been ignored for many months and I must get back to it. I'm in the throes of moving house so I'm really not sure when that will be. Anyway, I have enjoyed your progress through the house renovation and look forward to seeing the development of your garden. I love the paint colours. So glad to get another "Hug" post. (So many have abandoned their blogs altogether.) Your backyard is beautiful in the snow. A very creative use for your front porch posts! Gina, that is so nice of you to say - I know, I always feel so sad when I come across a neglected blog. I would hate to do that to Hugs! You'll get back to your blog when it's the right time... and I will too, hopefully sooner rather than later! I noticed that the pergola next door is still in good shape after about 18 years so hopefully our columns will have a good long life in their new role!